This post belongs to the serie "A gentle introduction to Metalsmith"
As stated in the previous post, Metalsmith is a wonderful tool for anyone wanting to build a static site with the node platform. In this post, we’ll learn a bit more about how Metalsmith processes the source directory. I assume that you already have a working installation. You can find how to do it by reading its official web site. Create a subdirectory named src. This is the default name of the source directory for Metalsmith. Put a bunch of directories and files into it. Be creative here ! Create a script named index.js (or whatever name you like) at the same level then the source directory. For now leave it empty. Before running any command, let’s try to have a grasp of what Metalsmith will do when we run it. Then every plugin will be called in turn with this map (among other arguments) and have a chance to modify it. Ultimately, the content of the map is written to the build directory. __dirname is a node.js variable set to the directory where the script resides. You can then execute the script by doing node index.js. Nice we just achieved to copy the source directory into the destination directory… There are simpler tools to do that, isn’t it ? contents: buffer receiving the content of the file. Yes, all the contents of all the files are in memory. But you’re not the NSA, so you may not have too much data to remember, no ? 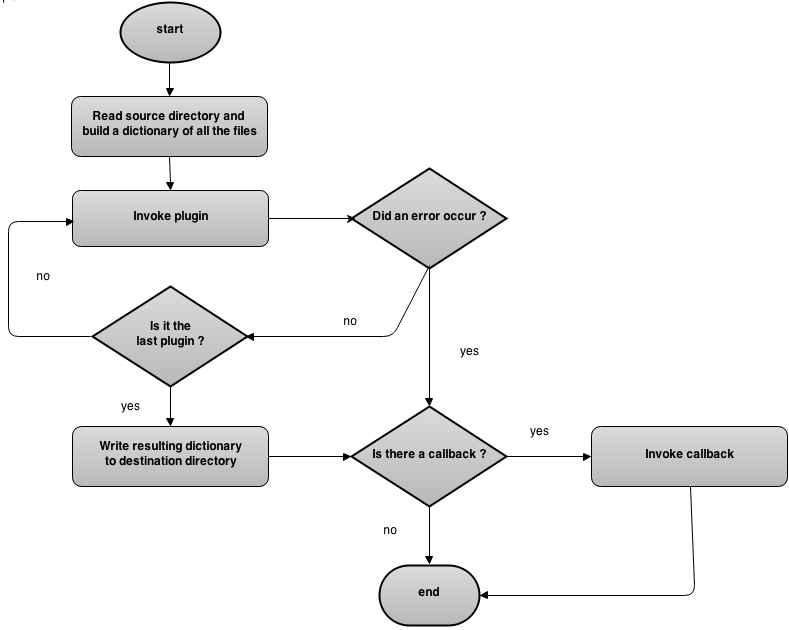 mode: octal representation of the file’s permissions in the file system. We’re not gonna make it far with so few informations, and not every data can be computed with a plugin. So it would be nice to have a way to add data while writing our files… Good news, it’s possible ! To achieve this goal, Metalsmith uses front-matter which lets us add YAML metadata to a file if we want to. Let’s try it by adding YAML metadata to (at least) one of the files, then run the script again. You should see the metadata in the corresponding value. But what happens if a plugin can’t do its work properly because, for example, it lacks the correct configuration or the YAML metadata expected ? It probably shouldn’t hand over to the next plugin, because there are chances that the remaining plugins are relying on the work of previous plugins. Running that, you shouldn’t see any logging information. Actually, you shouldn’t see anything… Wait, does it mean that if a plugin fails, there is no obvious way to be notified ? Obviously no, because no matter if all went smoothly or if a plugin failed, Metalsmith gives us the opportunity to set a callback that will end the workflow. It’s just that we didn’t set it for the moment, because we didn’t pass any argument to the build() method. As you can see, this callback is passed an error argument in the case something went wrong. If you execute the script again, you should now see an error message complaining that the mojo is lost. And if you remove the use of the mojoLost plugin, you’ll see a message informing you that your new sword is ready. Good fight ! In the next post, we’ll write a more complex metalsmith plugin.